Exposed: The Female Lens in a Post-Identity Era? Moderated by Claudia James Bartlett, Owner and Director of photo l.a.
A photographic examination of identity through the artistry of some of the most compelling female photographers working in California today. What does a ‘female lens’ signify today? Exposed: The Female Lens in a Post-Identity Era? photography exhibition aims to provide the viewer with a wide range of female artists examining life in their own terms. With exclusively female photographers, the cliché that women see the world (and themselves) differently is examined. Under inspection as well, is the evolving Californian aesthetic and growing prominence in the contemporary art scene. The work on display confronts societal norms, embraces universal truths and celebrates the versality of photography to represent our times. Deciding if gender or location affects perspective is left for the visitor to decide. The artists showcased in this exhibition have generously answered this multi-layered question with frankness and simplicity. We hope that their responses, displayed next to their works, will give insight into the artists’ process and allow one to search out an empathic connection to the work. 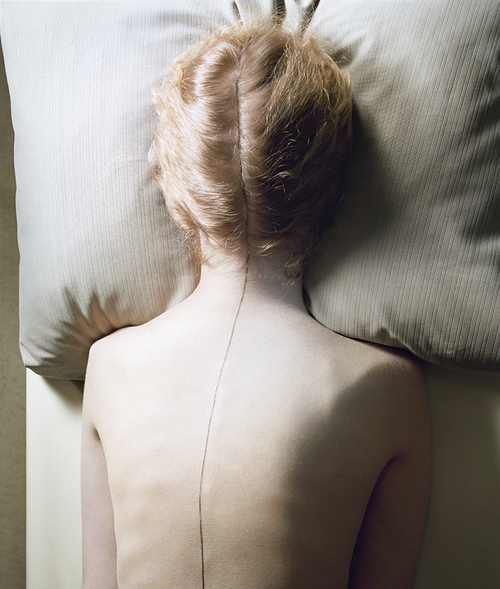 Jo Ann Callis, considered one of Los Angeles most influential female photographers working today. Jo Ann has only recently begun displaying her early color photography works (circa 1979). Her fabricated photographs seemed designed to elicit associations about domesticity and submissive sexuality. Her works dive into the subconscious realm, thereby suggesting no direct connection to any time or place. Their apparent timelessness speaks to aspects of our true nature. Arden Surdham, series “Hold Your Breath,” creates mysterious forms that capture our imagination while simultaneously making us uneasy. Her mysterious creations elicit limitless identities in which to indulge. The artist invites us to imagine endlessly by leaving her works untitled. Gay Ribisi, debuts her tender portraits exploring SSBBW (Super Sized Big Beautiful Women). Her monumental contemporary fertility goddesses provide a platform to discuss body image and the historical change from a matriarchal society to patriarchal. Privately collected, CMATO has the distinction of presenting her work to public audiences for the first time. Sant Khalsa, b. 196 (Working in Riverside, CA) might say her work reflects her artistic intimacy with nature and her lifelong passion of activism. Her imagery has a quiet controversy that slowly empowers the viewer to breathe deeply and reflect in the present moment. In her works, humanity is identified with nature; boulders, shrubs and brooks become the centerfolds in her works. Sandra Klein works evokes a curiosity either about her view of the world or her magical mindset. There is a map to her personal history in her art that shows a personal struggle and vulnerability that an audience can empathize with. Her works draw the observer into a creative narrative; real or imagined, a journey down the rabbit hole to search introspectively begins. The focus of Klein’s work reaches beyond physical body and investigates the universe of the mind. Her work asks the viewer to open the shutters of the mind and focus on the composition of what lies within. Klein carefully layers imagery of mental health, spirituality, and the challenges of the human body as it ages. Andréanne Michon, engages viewers through her large format photographs, video and mixed-media installations. Her work encapsulates the viewer with their physical presence. Some of her photographic works are positioned upwards and span across the gallery walls, surrounding the viewer as if they are walking on nature trail. Her works are large images of dense groves, meant to exaggerate the contrast of nature against a thumbnail frame of a smartphone. Her intention is to widen this narrowed view encouraging us to break our dependence, or need, for a digital identity. Femmes Photo Fest Continues at Four Friends Gallery with images from the Janss Collection.